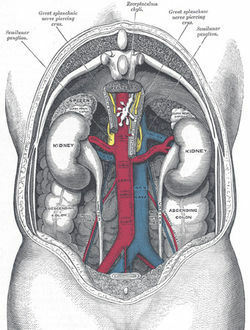 In humans, the kidneys are located in the posterior part of the abdomen. There is one on each side of the spine; the right kidney sits just below the liver, the left below the diaphragm and adjacent to the spleen. Above each kidney is an adrenal gland (also called the suprarenal gland). The kidneys are retroperitoneal, which means they lie behind the peritoneum, the lining of the abdominal cavity. They are approximately at the vertebral level T12 to L3, and the right kidney usually lies slightly lower than the left in order to accommodate the liver. The upper parts of the kidneys are partially protected by the eleventh and twelfth ribs, and each whole kidney is surrounded by two layers of fat (the perirenal fat and the pararenal fat) which help to cushion it. OrganizationIn a normal human adult, each kidney is about 11 cm long and about 5 cm thick, weighing 150 grams. The kidneys are "bean-shaped" organs, and have a concave side facing inwards (medially). On this medial aspect of each kidney is an opening, called the hilum, which admits the renal artery, the renal vein, nerves, and the ureter.The outermost portion of the kidney is called the renal cortex, which sits directly beneath the kidney's loose connective tissue capsule. Deep to the cortex lies the renal medulla, which is divided into 10-20 renal pyramids in humans. Each pyramid together with the associated overlying cortex forms a renal lobe. The tip of each pyramid (called a papilla) empties into a calyx, and the calyces empty into the renal pelvis. The pelvis transmits urine to the urinary bladder via the ureter. The basic functional unit of the kidney is the nephron, of which there are more than a million in each normal adult human kidney. Nephrons regulate water and soluable matter (especially electrolytes) in the body by first filtering the blood, then reabsorbing some necessary fluid and molecules while secreting other, unneeded molecules. Reabsorption and secretion are accomplished with both cotransport and countertransport mechanisms established in the nephrons and associated collecting ducts.